15'' Black PC99 4-in-1 Console Extension Cable. If you want to position your keyboard, monitor mouse, and speakers away from your computer but don''t want the clutter of four extension cables, the StarTech.com 4N1PSEXT15BK is the cable for you. We''ve taken our popular 3-in-1 keyboard/monitor/mouse extension cables and added a fourth element: a high-quality audio cable made with shielded wire and gold-plated connectors for ultimate sound clarity. With all four extension cables fused into one fifteen-foot cable, you don''t have to worry about cable tangles or a cluttered computer area. Each connector is color-coded according to PC99 specifications for easy installation. 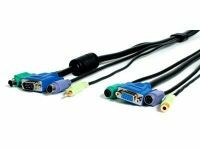 The high-quality video cable features double-shielding and a ferrite core to eliminate signal interface, giving you crystal-clear video quality.